As with any first day at a new school, Kirby Quinn had plenty of questions, and some jangled nerves, as she began her journey as a first-year medical student at the University of Miami Miller School of Medicine. Dean Henri R. Ford, M.D., M.H.A., welcomes students and parents at the Medical Parents Association orientation dinner. A member of the Class of 2022, the 23-year old knows she has a long road ahead of her. But she was pleased that the school’s Medical Parents Association (MPA) tried to smooth the way by answering her questions, as well as those her parents had, at its annual orientation dinner. Quinn, her new classmates, and their families got a glimpse of what is ahead for them over the next four years at the event, which is traditionally held the night before the students begin two days of orientation at the medical school. “Your family member stands on the threshold of an incredible adventure as they begin the journey of going from pre-med student to a Miller School-trained physician,” said Lourdes Sanjenis, M.D., M.B.A. ’96, who along with Vicky Egusquiza, M.D. ’87, is co-president of the MPA. 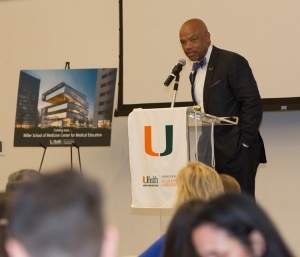 The orientation dinner was held August 8 at the Donna E. Shalala Student Center on UM’s Coral Gables campus. The families enjoyed a buffet dinner while listening to an overview of the medical school’s curriculum, resources, and requirements. Henri R. Ford, M.D., M.H.A., the new dean and chief academic officer of the Miller School, thanked the parents for entrusting the faculty with the task of teaching and training their loved ones. Richard Weisman, Pharm. D., associate dean of admissions and enrollment, highlighted the record-setting caliber of the class, calling it “the smartest ever admitted,” with average GPA scores of 3.71, average science GPA scores of 3.62, and MCAT scores in the 87th percentile nationwide. Out of a total 8,497 applications, the medical school ultimately matriculated 205 students in the Class of 2022, including 154 in the M.D. program and 51 in the M.D./M.P.H. program. Weisman said one of the most important statistics was that 91 percent of the incoming class were accepted at two or more medical schools, and 51 percent were accepted at three or more schools. “You truly had options and we’re very happy that when you evaluated those choices, you chose the University of Miami,” he said. Other numbers show that nearly half, 45.9 percent, come from outside the state of Florida, 58 percent are women, 52 percent are minorities, and 31 percent are underrepresented in medicine. The families also heard from Chris Alabiad, M.D. ’02, assistant dean for student affairs. But staying on par with the busy course work and requirements can threaten to become overwhelming for some students, who may find it difficult to cope. Hilit F. Mechaber, M.D. ’95, associate dean for student services, urged the students to make time for themselves and understand that while their four years of medical school will be exciting, it will also be challenging. Mechaber said that parents can play an important role in battling stress. “You can be exceptionally helpful here by reminding your students that they need to know where to look for information, and to not be afraid to ask for help,” said Mechaber, who is also an associate professor of medicine. Organizers are hoping parents use the next four years to become active participants with the MPA. The all-volunteer organization supports and helps to sponsor many Miller School programs, including student health fairs, the John G. Clarkson Freshman Pinning Ceremony, Dean’s Cup, and Match Day. One of the MPA’s roles is providing assistance to the Mitchell Wolfson Sr. Department of Community Service (DOCS), which hosts 10 health fairs each year to provide health screenings and services to uninsured and underserved populations in South Florida. Vedant Acharya, an M.D. candidate in the Class of 2020 and one of the program’s executive directors, echoed the call for parents and students alike to become involved with the student-run program. A gallery of photos from the orientation can be seen here.